Free Samples! Try before you buy. Browse a variety of materials to find one that matches your application! Rolls, sheets, cut-to-size finishing options available! Sheet LabelsChoose from any quantity, materials, shapes, sizes and colors. Great for applying labels by hand & printing on demand. 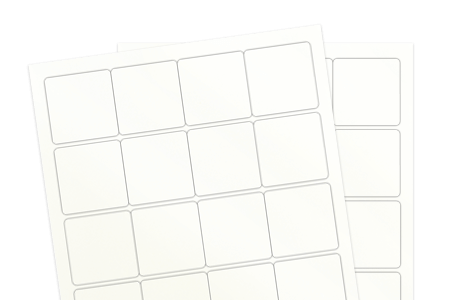 Cut-to-Size LabelsGreat for any square or rectangle shape, hand applying labels, any quantity. Easy ordering & fast delivery. Roll LabelsGreat for larger quantities, machine applied labeling, custom sizes & laminated options available. Low prices! Shop Product LabelsSort by a variety of label uses to find the perfect solution for your label needs. Durable, tear resistant and weatherproof / waterproof (yay! ), the crystal clear gloss label material provides protection from the elements, making it ideal for both indoor and outdoor use. Try reverse printing on this material and sticking to windows, or integrate into your promotional use! See why we are the leader in clear labels! Sheet Size: All Sheet Sizes 8.5" x 11" 8.5" x 12" 8.5" x 14" 11" x 17"
No exact matches found. Displaying similar sizes within 1 inch. Shopping with sheetlabels.com is always safe and secure. 24 Native Drive, Queensbury, NY 12804. Sign up for our newsletter to save!